Explore the flavors of Thailand at Supatra's! Peppery is perhaps the best way to describe this type of basil, which is used in stir-fries. Holy Basil is typically not eaten raw and can be frozen or dried for later use. With an anise-like flavor, Thai basil is used in curries and stir-fries. It's also eaten fresh with noodle soup and will not keep for long (it also does not freeze or dry well). 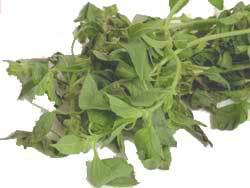 Used in soups and to flavor steamed fish and vegetables, lemon basil has a real citrus-like aroma and flavor. It can be frozen or dried for later use (called e-too in Lao). Lime leaves are used whole in soups and curries and cut-up for salads. They can be preserved in the freezer. Galanga is used in soups such as Tom Yum and Tom Kha Gai, curry pastes and is sliced up for use in salads. Lemon grass is used in soups such as Tom Yum and Tom Kha Gai. It's sliced for use in salads as well. Ginger is used in many different dishes. It's spicier than galanga and the skin must be peeled before using. Young Ginger is picked earlier than ginger and has a more subtle flavor. The skin can be left on for cooking. Krachai, a relative of ginger, is used in Kanom Jeen Numya, a curry dish. It's available frozen or in jars (shredded or whole). Dried Thai chili is used in soups, salads and stir-fries and is ground or served whole. Turmeric, a relative of ginger, adds yellow color to food and is an integral ingredient in some curry pastes. Thai eggplant is used in curries, Som Tum, and is eaten raw. Cherry eggplant is used in curries and is eaten with Nam Prik. It's very bitter! Chinese eggplant is used is used in stir-fries or is steamed. Long bean is used in curries, stir-fries, and Som Tum (Green Papaya Salad). They're crunchier than regular green beans. Green papaya is shredded to make the famous spicy Thai salad called Som Tum! Green unripe papaya is available in most Asian markets. Pickling cucumbers are crunchier than regular cucumbers and are eaten raw or used to make a salad called Tum Tang (it's similar to Som Tum). Pac Peow is eaten raw with salads or noodles. Pac peow can be found in many Southeast Asian markets. Mint is used in Laab and other salads and is served with noodle soup. Culantro is usually eaten raw and can also be cut up and added to Laab (Isaan Meat Salad). Water Spinach (Pak Boong in Thai and Ong Choy in Chinese) is generally cooked with oyster sauce or soy sauce and is also eaten raw. Krachet is grown in water and the foam-like material covering the stem must be removed before eating. Cha-om is a very unusual tasting (and smelling) vegetable that is most commonly cooked with eggs. The botanical name is Acacia Pennata. Kowtong is eaten raw or can also be used in salads. It has a fish-like flavor. Bitter Leaf (Chapoo in Thai and E-lert in Lao) is eaten raw with Laab or used in soup or salads. Kayang is an herb that is eaten raw (in Northeast Thailand) or used to make Om. Kayang has a very unusual fish-like flavor. Chinese Brocolli (Kana in Thai or Gai-lan in Chinese) is more flavorful than regular brocolli and is steamed or stir-fried in dishes such as Rad Na. Yu Choy (Pak Got Dok), is similar to Napa but has a stronger flavor and is eaten raw, steamed or in stir-fries. Baby Bok Choy (Pak Got Shanghai) is steamed and eaten with Nam Prik or used in stir-fries or soups. Katin is eaten raw with Nam Prik and tastes somewhat like Cha-om. It comes in bunches of strings about 4-6 inches in length. Pea Tips (Yat Tua Lan Tao) are cooked in stir-fries and eaten raw with Nam Prik dipping sauce. Wing Bean (Tua Poo) is very crunchy and tastes somewhat similar to long beans. It's eaten raw and is also used in Tod Mun fish cakes. Chinese Celery (Kun Chai) is used in many dishes and is similar to celery, but has a stronger flavor. Asian Chives (Gooey Chai) are used in Pad Thai and stir-fries and are eaten raw. Chive Flowers (Dok Gui Chai) are the flowering tips of chives and are used in stir-fries. Bitter Melon (Marah in Thai) is a very bitter vegetable used in stir-fries and soups. Lin Fah (Dragon Tongue) is usually steamed and eaten with Nam Prik. It's available frozen at some Asian markets. Okra (Makuea Sawanh) is steamed and eaten as a vegetable or used in stir-fries. Sadao flowers and leaves are very bitter and are eaten with Nam Prik or Laab. Samek leaves are very sour and are eaten with Laab or Nam Prik. Tia To leaves are citrusy-tasting and are eaten with Laab. Fuzzy Squash (Fak Kiow) is used in soups and stir-fries. Sometimes called Moqua in Asian markets, the hairs must be removed before cooking. Opo Squash (Nam Tao) is also called bottle gourd or calabash. Opo is used in soups and stir-fries and is also steamed and eaten with Nam Prik. Banana Flower (Hua Plee) is eaten with Kanom Jeen Namya and Pad Thai. Only the tender inside part is eaten. Banana Leaves (Bai Tong) are used to wrap up food prior to steaming. They impart a very subtle, grassy flavor to the food. Pandan Leaves (Bai toey) are used for wrapping up food prior to steaming. The flavor they impart is similar to roasted young coconut juice. Daikon Radish (Hua Pak Got Kao) is used in soups and stir-fries. Daikon is also used in a deep-fried tempura-like appetizer. Bamboo Shoots (Naw Mai) are used in some Thai curries and a special Isaan curry called Gang Naw Mai. Water Chestnuts (Haew) are very crunchy and delicious. They're used in many different dishes. Taro Root (Pueak) is primarily used in making Thai desserts. Taro also comes in a purple variety. Boniato (Mun Tet) is primarily used in making Thai desserts. Boniato, as well as taro, is available at many Asian markets. Yucca Root (Mun Sum Pa Lunk) is primarily used in making Thai desserts. Yucca is also called tapioca or cassava. Garlic (Kratiem) is used in virtually all Thai dishes. Green Onion (Homm Sot) is used in many Thai salads, stir-fries and Pad Thai. Cilantro (Pak Chee) comes from the coriander seed and is used in many different Thai dishes. Dill (Pak Chee Lao) is used a lot in Northeast Thai cooking, in dishes such as Om (Beef Curry) and Ab Hoy Shell (Steamed Seafood). It's also eaten raw and is usually much cheaper at Asian markets than at supermarkets. Bai Yanang leaves are used in Gang Naw Mai and other dishes from Northeast Thailand featuring bamboo shoots. Lotus Root (Hua Bua) is the root of the water lotus plant and is most often used to make desserts or drinks. Mayom Leaves (Bai Mayom) are leaves of the Otaheite Gooseberry. They're eaten with Laab or Nam Prik. Pak Van is eaten with Laab or Nam Prik and grows like a ground cover in Thailand near rice paddies. Chayote (Mala Waan) tastes like fuzzy gourd and is used in Red Curry with Chicken, Clear Hot Soup with Fish and other stir-fried dishes. Sugar Cane stick (Oye) Thai people eat sugar cane as a candy and it's added to soup broth for sweet flavoring. Sugar cane is also used as a skewer for grilling. Sher-lihon (Pak Gat Kaan Kluay and Hmong Gai Choy in English) tastes similar to Bok Choy and is steamed, stir-fried and pickled. Bitter Melon Leaves (Yod Mala) have a bitter taste and are very good in the Issan dish Beef Om. They're also steamed and eaten with dipping sauce. Bitter melon leaves are often available at farmers markets. Kee Lek leaves have a strong bitter taste and have to be boiled in hot water and drained several times before they're used to make Curry with Beef Tendon (Gang Kee Lek Sai En Voaw). It is a most unique curry! Pak Waan has very plain taste and is good for steaming and serving with dipping sauce. Pak Waan is also used to make soup with smoked fish or ant's eggs. Pak Thew is a wild vegetable like Kadon and Kee Lek. It has a sour taste like Young Tamarind leaves and is good for Hot and Sour Fish Soup. Pak Thew is also eaten raw with meat salad (Laab) and Kao Tod Nam Klook (Rice Curry Salad). Pak Kaat is well known in Northeast Thailand and is used for fish curry and beef. Both the leaves and the flowers are added to the curry and it has a smell like raw beef. Pennywort (Bai Bua Bok or Pak Ngong in Isaan) grows wild like a groundcover and tastes a little bitter. Pak Ngong is made into a juice called nam bai bua bok and is also eaten raw with coconut noodle curry, Pad Thai and Laab. Satoh Bean is similar in appearance to a lima bean and is used in stir-fries and curries and is also eaten raw with dipping sauce. Satoh is well known in the south of Thailand and tastes like Katin and Chaom. Tamarind Leaves (Yod Makaam On) are sour and are eaten with salt as a snack and used to replace lime or lemon in chicken and fish soups. Sesame Leaves (Bai Nga) are used to wrap up beef for grilling (they can substitute for Beefsteak Plant (Shiso leaves) and taste similar to chapoo leaves. Drumstick Tree Fruit is often called Malunggay in Asian markets as that is what it's called in the Philippines. The pods are about 6 inches to 1 foot long. Thai Edible Flower (Dok Grah-geow) tastes similar to ginger and can be purchased frozen imported from Thailand.